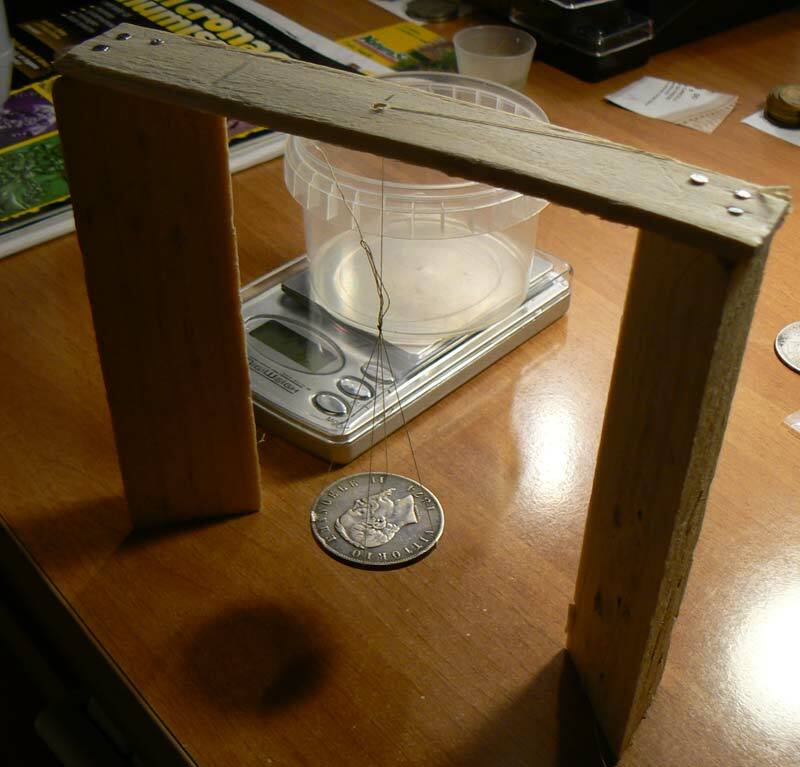 Knowing the weight and volume it is possible to determine the specific gravity (SG) of the coin, moreover if the alloy components are known it is possible to determine with good precision the relative weight. Often the purity of the metal is a good sign of authenticity. If we want to use a simple measure of weight in order to identify a false coin is not a procedure that can always be right, because the weight is the physical parameter easier to measure, and therefore it is reproduced with absolute accuracy by forgers. 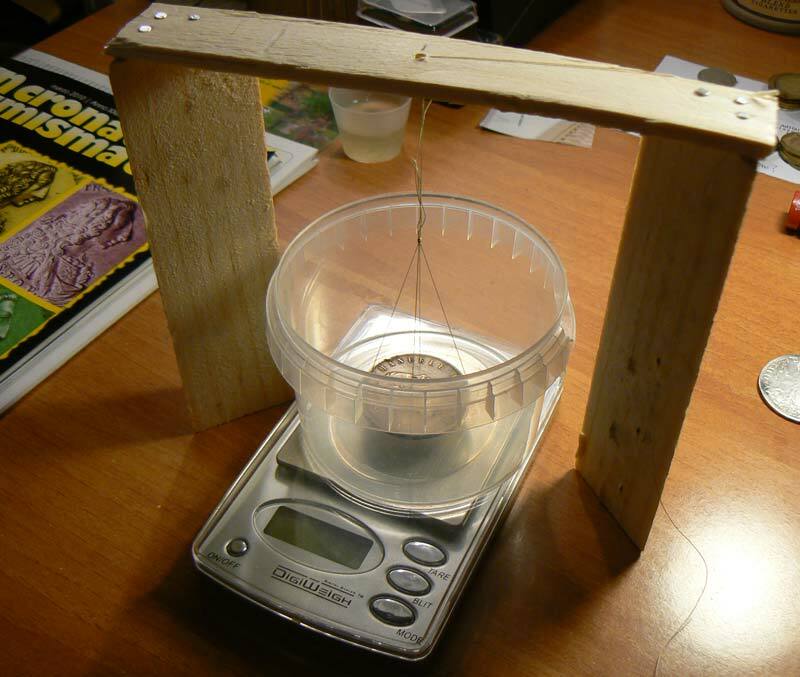 The experiment exploits the physical principle that a body immersed in a liquid increases the extent of the liquid volume by an amount equal to the volume of the body. If we know the specific weight of the liquid we can determine the volume of the body and therefore its specific gravity. We take our "guinea pig" for this experiment: a Vittorio Emanuele II scudo 1874. 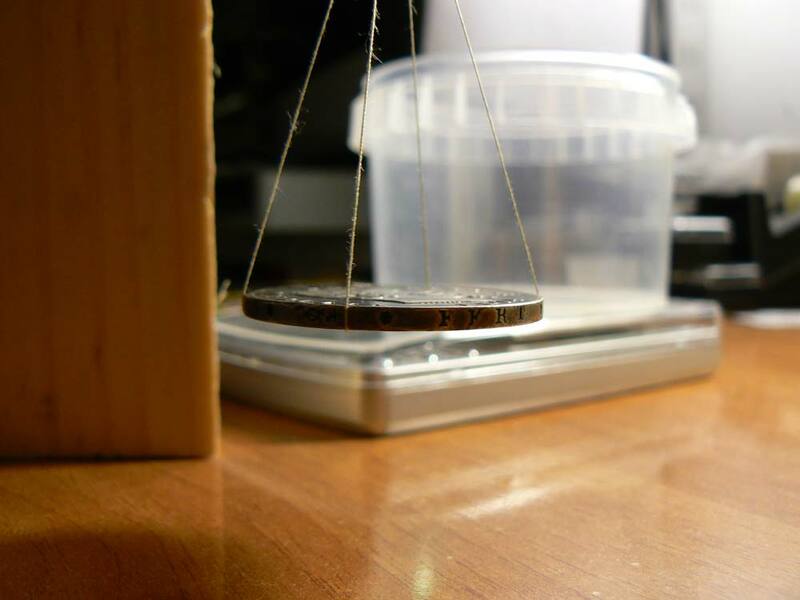 3 - first it is need to weigh the coin "dry", the coin shows no obvious signs of dust, only a slight patina. 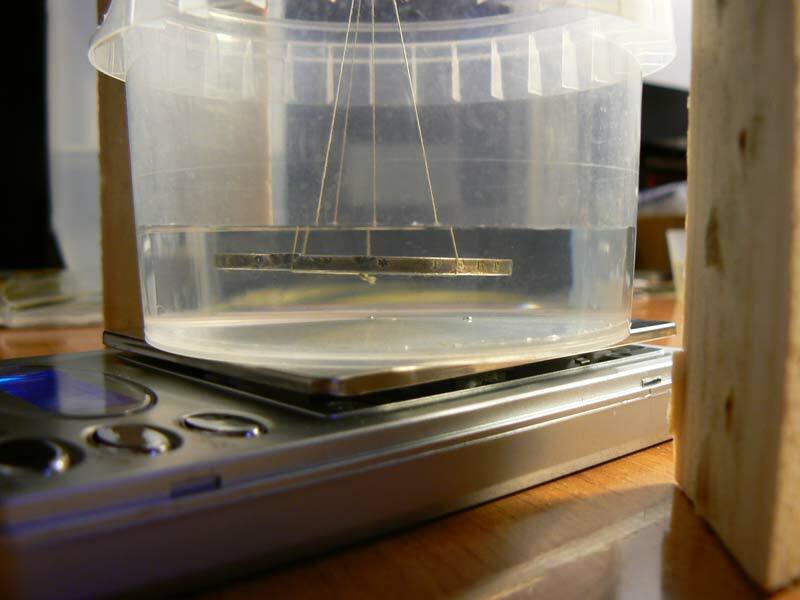 in the following pictures you can see the suspension system built with pieces of a wooden fruit box, the wire is an ordinary sewing thread, it is important that this should be as light as possible. 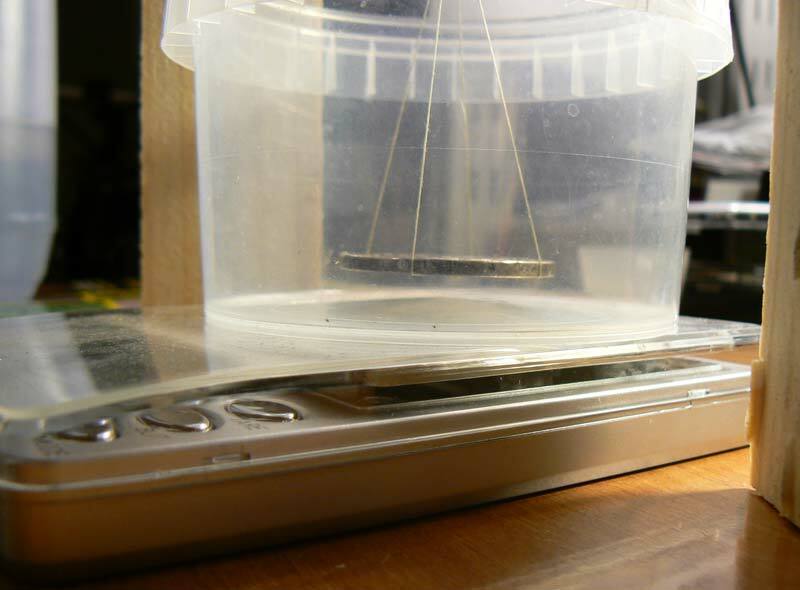 I tried to weigh the wire in water but, after carefully dipped a piece of wire 20 times greater than that we're going to immerse with the coin, I hadn't a considerable measure, so the wire immersed give as difference in weight less than 5% of 0,01 gram. We can consider its weight negligible. At this point we can check the built suspension system and we can adjust the length of the wire. We need to get a small can of clear plastic (must be light and transparent). 5 - add distilled water in the jar (washed and cleaned if possible), it is important to use distilled water because it it a liquid which is known exactly the specific gravity. It is possible to use other liquids but we have also different calculations. 6 - weight the jar with water taking care not to go over the capacity of the digital scale. 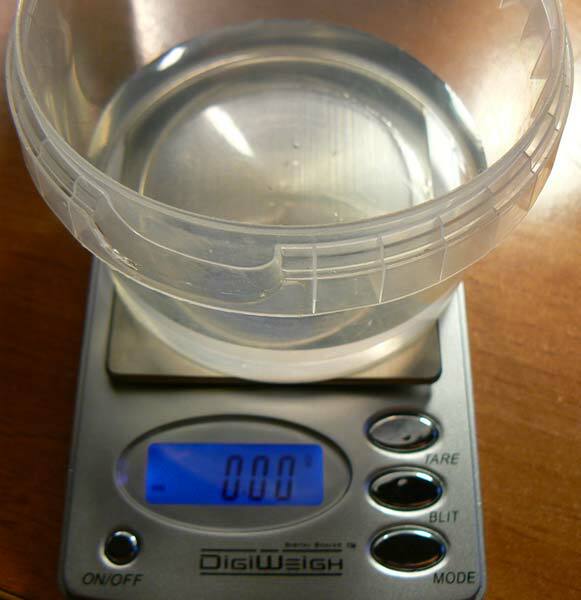 you can see in the figure below the coin immersed in water and the reading of the weigh. Now we're almost there! a bit of math will be with us until the end. will be useful to calculate the error. Note: We are calculating the specific gravity, since we use distilled water that has the same value of density (gt/cm3) if we use another liquid the calculations are different. The calculation of a specific gravity of a big can be carried out, as we have seen, with a digital scale that have an accuracy of 0,01 grams. Such kind of digital weight can be used with coins that weight more than 5 grams. As it is possible to see an error of 1% can give a different specific gravity, up to 10% ! In table if a coin with a weight of 6,22 grams is taken than it is possible to find purity from 835 to 980: too much. 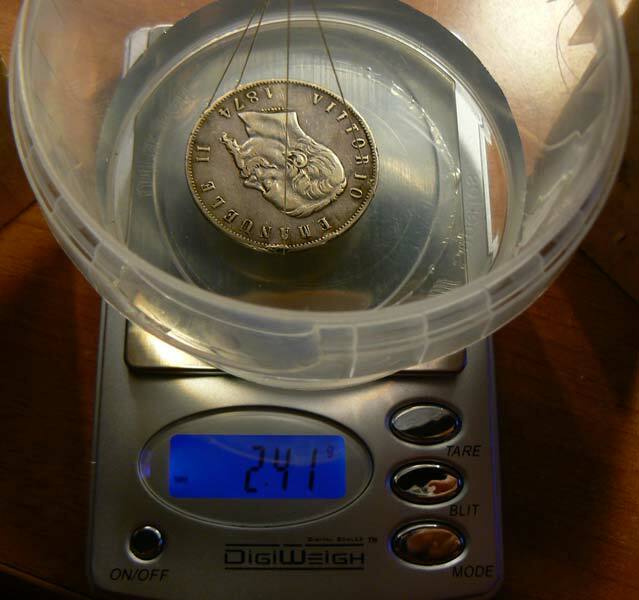 For example below the result of some measurement carried out on some Italian coins of 5 lire of Vittorio Emanule III that have purity of 835 and a weight of 5 grams. In chart below the squared dots are the result of experiment carried with a 0,01 digital scale. So if we want evaluate the specific gravity of a Roman denari or a gold zecchino we have to use a digital scale with an accuracy of 0,001 grams. As we can see we can have great accuracy also for "small" coins. For Alloy we have to calculate the percentage in weight of the mail metal against the other alloy composition. For example if a SG of a denarius of Titus is found to be 10.4, meaning it contains 94% silver and 6% copper and impurities. 'The Specific Gravity of the Gold Coins of Aksum' by W. A. Oddy and S. C. Monro-Hay in 'Metallurgy in Numismatics' by Metcalf and Oddy, 1980. 91% = SG of 18.01. Thanks to Marvin of Moneta-L for this data. Plese remember that in many gold coins the know gold content in the alloy can be found to be with an error of +/- 2,0%. for maximum accuracy, the coin should be cleaned and degreased, as is feasible without major problems on gold is not on silver coins that could be ruined if patina is taken away. becomes difficult to resolve the problem mathematically in the case of three or more metal alloys, the only viable solution is the use of XRF spectrometry (X-ray Fluorescence) (but that give indication of alloy composition only of the most surface layer of the coin). With an alloy of three metals, if we do not know any of the three ratios we should solve two equations with three unknowns and this is not possible, however, we could take same assumptions and calculate the possible error to see how this could affect the result. For many ancient silver coins like antoninianus, Alexander tetradracms, etc. namely coins that are not in simple binary alloy, the result would be just a number to be interpreted, and can be used at least, for comparative tests. In practice, the results must always be interpreted and not used as the verdicts on the coins analysed. If you analyse gold and silver having a high title, say above 95% then the results can be accurate and can give us a good indication of the alloy of the coin. Gradually, the title of principal metal decreases the results are increasingly inaccurate. Coins that have low gold content would not give such great signs from their specific gravity because we do not know the proportion of other metals in the alloy. The proposed method it is useful to calculate with good accuracy the specific gravity of a coin, applies to antique and modern coins, and it is not at all destructive. A really useful tool in the hands of enthusiasts and professionals to get a good indication of the specific gravity of the coin that is going to be studied! Use of another liquid for the measure. to avoid generation of bubbles in our weight experiment we can use a different liquid insted demineralized water. We have to keep in account the different specific gravity of the new liquid we are going to use. A different solution is to wet the coin in alcohol, the adherence of alcohol to coin is, we would dare to say, far less than volume of the thread that hangs the coin. On the other side, alcohol mixes with water, and is only measured the volume (well, weight) of coin. Also we could use de-mineralized water with a drop of tensioactive, being the best dioctylsodiumsulfosuccinate (aerosol OT is a commercial brand). But that is not that easy to get. Finally we can simply add a drop of the dishwasher we use generally. we could use a little transparent dish where we could place the coin we are going to weight. We always be careful to avoid bubbles between dish and coin, for little coins can be useful to submerge before the little dish and then "diving" over the coin being careful do not touch the water. we assume that the specific gravity of alloy composition is given on mass and not in volume. This is not correct but in case of two metals the error is negligible. If we assume that a coin is made of two metals we could calculate the title. Parg and Pram the weights respectively of silver and copper in the coin. Psarg and Psram the specific gravity respectively of silver and copper. The thickness was measured at the edge with a micrometer that appreciates the tenth of a millimetre. Please note however that the specific gravity of alloy composition is given on mass and not in volume. Ie every 100 grams of Ag900 90 grams are silver and 10 grams copper. If we make the calculation of the specific gravity with volume ratio we would have an approximation because the assumption that the total volume of the alloy is equal to the volume of the two separated metals is not always true, however in this case the error would be not so high. In any case if we do the calculation using volume ratios we reach a very close result, it is not the sore point. 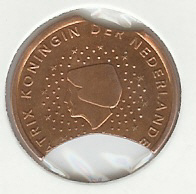 then this technique is wrong and can not be used for the calculation of a coin volume.